Jijamata Udyan, Mumbai, better known as Rani Bagh was established as a public Botanical garden in 1861 by the then Agro-Horticultural Society. This city green lung and historical nature site is home to 3,177 trees of 227 species. The current entry tariff is low and thousands of common citizens visit daily. However, there is now an imminent danger to trees in this 53 acre park and the likelihood of the future entry fee to this public park becoming prohibitively expensive pursuant to the recently publicized Municipal Corporation plans for the ‘modernization’ and ‘development’ of Rani Bagh. The “makeover” comes with the hefty price tag of Rs. 433.57 crore as per a contract between the MCGM and HKS Designer and Consultant International (a Thai-based Malaysian company) and the Portico Group of the USA. There is no vacant treeless space for any construction in this vital green haven. The Municipal Corporation plans to build a new aquarium, theatre, and exploration centre, car park, staff quarters, and expansion of the animal hospital. Construction activity on this scale will most likely lead to a massive tree felling exercise and entry fee hike. Consequently, concerned citizens and organisations have formed the Save Rani Bagh Botanical Garden Action Committee. Following is a brief update about the plan of action followed during the campaign to raise awareness and exert sustained pressure on the various authorities. A slew of Right to Information (RTI) applications and letters to the CZA, the Municipal Commissioner, the Garden Superintendent and the Tree Authority has yielded valuable data which we use to present fresh objections and seek further clarifications of the various authorities; however the crucial Master Plan for the ‘makeover’ is still withheld. The Central Zoo Authority, whose approval of the Master Plan is mandatory, has in response to our numerous letters and RTI applications, intimated us that our concerns are duly noted. Our committee met the visiting CZA team in Mumbai and apart from stressing our firm opposition to any ‘makeover’ discussed various facets of preserving Mumbai’s vital green lung and beautiful botanical park. Environmental groups like Bombay Natural History Society (BNHS), WWF-India, Sanctuary Asia, National Society of the Friends of the Trees (FOT), Conservation Action Trust (CAT) and Bombay Environment Action Group (BEAG) have extended valuable support through their newsletters, magazines and websites, addressed a joint press meet and issued statements and press releases. Awareness generation through direct contact programmes (slide shows, talks and distribution of information handouts), Rani Bagh nature trails, newspaper and television coverage and of course through our website and on-line petition has been an ongoing exercise. The Heritage Conservation Committee has been alerted to the imminent threat to Rani Bagh, a Grade II B heritage precinct (the botanical garden won an award from the Indian Heritage Society on 12-12-2007). In addition, we have officially sought to enhance the heritage status of the V.J.B. Udyan (Rani Bagh) – an exercise for which all Mumbai environment and city open space groups have pledged support – in order to protect the botanical garden from any future onslaught of so-called development. The Indian Express (27-12-2007) in a front page article titled “Master plan for zoo hits hurdle as CZA expresses doubts” informs that CZA Member-Secretary B.R. Sharma has categorically stated that trees in the botanical garden will be felled if the revamp master plan is implemented. This amply vindicates our stand and is heartening news indeed, demonstrating the strength of the combined voice of common citizens. We welcome the CZA’s willingness to preserve Mumbai’s oldest botanical park. However, until any revamp plan protects the character and sanctity of this historic botanical park, we cannot rest assured that the 3,170 trees and right of affordable access to Rani Bagh is preserved for future generations. The coming weeks will indicate more clearly whether the master plan will be modified or discarded altogether. The Save Rani Bagh campaigners urge all who feel for the issue to spread the word and circulate the details of their on-line petition amongst friends and colleagues who have not signed it. When the plan was proposed several years ago and published in newspapers, I did not find any serious objections to this. Now that it has reached implementation stage, people are sitting up and taking notice. Agreed, there is a problem. Why not find and offer such a solution that no excuse can be made? There is nothing wrong in aquariums, theater and entertainment. What’s wrong is the chosen place. Let’s identify and suggest some alternate space for such things. Let the govt. go there and put up these things. Or they can even set up these entertainment parks just out side the city. There is plenty of space. Let city people go OUT and enjoy. The transport problem should be taken care of. Governments will always be corrupt. There is always an ulterior motive behind these politicians, developers, etc. They should not be allowed to succeed. The task should be to involve local people and educate them. Only people power can stop the powers that be. It’s virtually the same problem everywhere. The issue is not of the coming up the so called “developed” structures and making new construction. The issue is of how and where such structures come up and in what manner. Amidst other problems, there is a BIG issue of lack of vision and lack of innovation among the planners and the decision makers. Mostly, a green solution is around the corner, but no one really cares to notice it and give it a try. 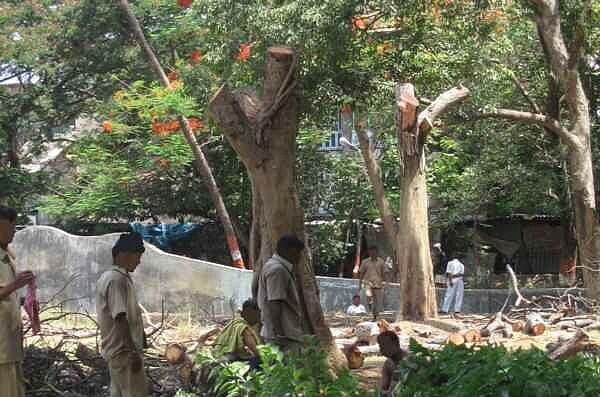 EVEN IN MY AREA…CUREENTLY..THERE HAS BEEEN…A TREND OF DESTROYING TREES…. TREES…… are a necessity. Only if we want this planet to live and thrive…. we have to protect trees. Please please be sensitive enough to, not harm them and our enviorenment. Lets make this world a better place to live and share it with all other creations of the Almighty!